The Vocational College has been working with Pilkington Down Stream branches for the last 2 years. 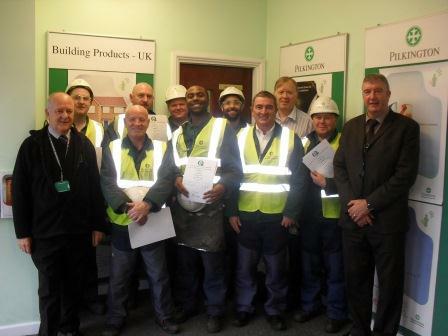 Pictured right are the latest branch operatives to receive their certificates from their assessor Mike Burbridge. Pilkington Nottingham enrolled 17 operatives onto the GQA QCF Level 2 Certificate in Glass Processing in September 2010. Branch Manager Garry Pearson said “The programme as a whole has been a huge success. The content of the programme has met our organisational needs and the way the assessor of The Vocational College has delivered the programme has made the whole experience worthwhile for all our operatives. There was also minimal disruption to normal operations whilst the programme was going on which was a big plus for us”. Assessor Mike Burbridge also praised the attitude of the operatives & Management at the branch saying “All operatives and Management at the branch have had a positive attitude towards the programme, their desire to achieve their NVQ’s was very evident from the off”. To date The Vocational College have been working with Pilkington Branches in Cumbernauld – Scotland, Gateshead – Newcastle, Bradford, Leeds, Sheffield, Liverpool, Basingstoke IGU, Basingstoke Merchants, London South, Basildon – Essex, Birmingham, Nottingham, Kings Norton – Midland & Redditch – Midlands; highlighting the Pilkington commitment to a competent and qualified workforce.